Nashend Glenfiddich (Glen) has his Dressage Debut! So I felt it was about time I dusted off my own competition gear and got back inside the boards rather than being the caller on the outside! I have been working with Glen and his owner, Clare, for almost a year now starting with a rather unruly pony who had spent the past year recovering from a rather nasty tendon injury. With a lot of hard work we are now at the point of having walk, trot and canter established under saddle and even a couple of in-hand shows to boot. The time had come for us to find our brave pants and to get Glen in front of the judges under saddle. I dug out my Tweed jacket and beige breeches (only right on a Highland, as I'm sure you'll agree!) and got practicing. Well what can I say, not only did Glen behave as if he's been in a warm up ring every day of his life but he really brought his A game once we stepped foot in the arena. We came away thrilled with his behavior and then even managed to get 65.4% and 4th place in Intro A! Back in March I was privileged enough to accompany Bella and her new pony, Pepper, on their trip to the beach at Frinton. Bella has now outgrown Summer so was joined by Pepper in the summer of 2018. They have been working hard together and have really come on leaps and bounds. 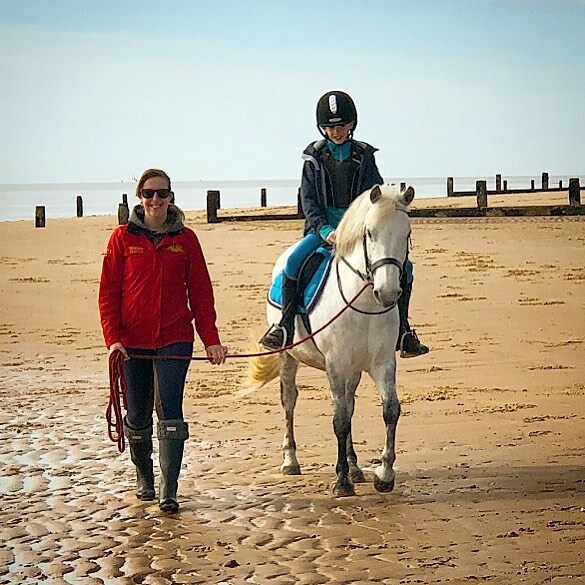 This was their second trip to the seaside together and the first time Bella was brave enough to have a canter (something I've always wanted to do and never had the chance!). They were so happy together and really brought a smile to all our faces, plus it helped that the sun was shining and it wasn't windy! Another certificate to add to the collection! 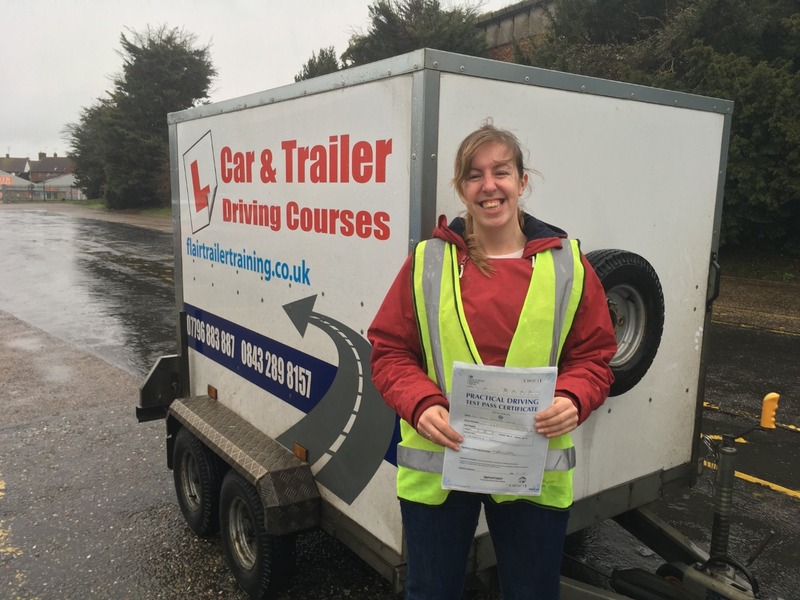 In March 2019, I took my B+E trailer test in horrendous weather conditions and am pleased to say I passed 1st time. I did my training and test in one day with the fantastic team at Flair Trailer Training and would actually do the training section all again tomorrow if I could, it was so much fun! I wasn't so thrilled about getting absolutely drenched uncoupling and re-coupling the trailer as part of my test, but we can't have everything. The Challenge Awards come to White Horse Support! This is a new offering from the British Horse Society and is aimed to support those owners that feel they want a little more knowledge and practical skills without the formality and pressure on the Stages Exam system. These can assessed in your own time, at your own pace, with your own horse! I am now a registered trainer and assessor for these awards with run at 3 levels; Bronze, Silver and Gold. 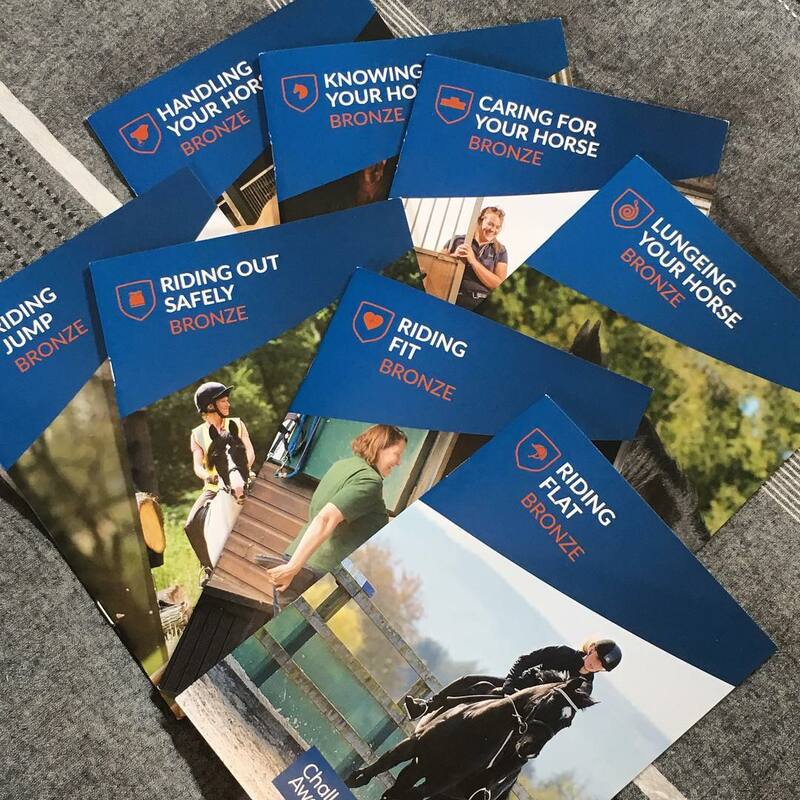 As you can see from the image, they can cover Care, Riding and Lunging and each come with a really smart handbook full of tips, information and assessment criteria. Contact me today if you want to know more or if you feel these might be for you, I'll be more than happy to discuss and get you up and running with this great program. Another new recruit for Team White Horse Support! I'd like to introduce you to Sasha and Daisy! I've been working with this gorgeous pair for a little while now and am thrilled with their progress. We've worked hard on their flatwork and they've been strutting their stuff within the Dressage Boards under my watchful eye. I'm really looking forward to seeing these two progress together and get out and about on those Cross Country Courses! Here's a snap of them both in their glad rags for a Dressage competition at Beechwood recently. Those of you that have followed my company for a while now, may remember little Bella and her gorgeous pony, Summer. Well Summer has returned home to her own but Bella had a chance to try a bit of showing with Summer at the Tiptree and Thurstable Show at Layer Marney Tower a few weeks ago. The girls took on Child Handler and gained a 6th and then Ridden Mountain and Moorland and came 2nd! As of 17th August, I became a British Horse Society Accredited Professional Coach! This replaces the old BHS Register of Instructors and has been a goal of mine for a good few years now. Its certainly taken a lot of work to get here but I'm so proud of my achievement. Twinkle toes strut their stuff at Dressage again! Another successful evening was had by all at Chelmsford Equestrian Centre on Friday 20th July for their Unaffiliated Dressage. I, along with 3 clients, were competing in test ranging from Intro up to Novice. We were all sporting our team saddle cloths and I'm really pleased with how smart everyone looked. We now have 7 weeks before their next evening so time to get practicing! I am thrilled to be able to announce that I my trip to Hartpury was well worth all the stress and I have achieved my Stage 3 Complete! This not only means I do not have to do the exam again (thank god!) but that I have also now achieved the status of Stage 3 Coach in Complete Horsemanship, previously known as BHSAI. This is a massive achievement for me and I'm enormously proud. Determined not to be beaten by exam nerves! 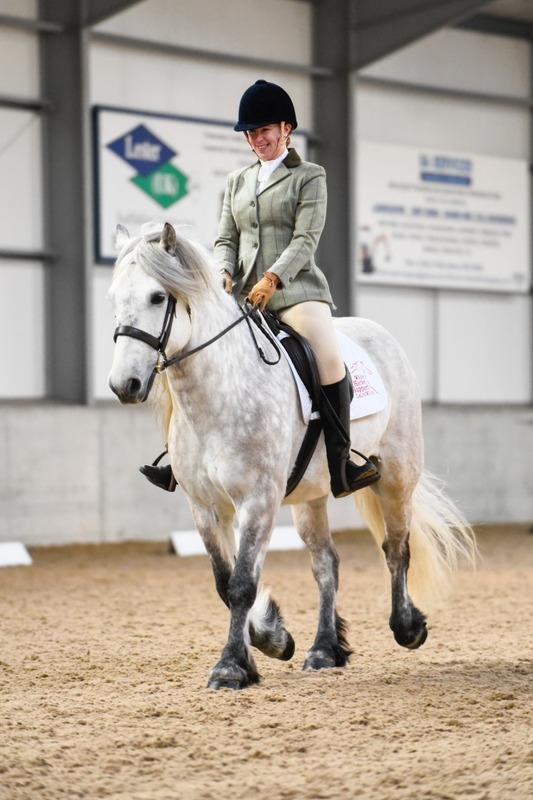 Having sadly not quite got the results I wanted from my last Stage 3 exam, I headed over to Hartpury College on 30th May to resit the final 4 criteria for the care and lunging sections. I am pleased to say that it was a far more positive day and I am much more confident I've done all I needed to do. Now for the long 2 week wait for results! 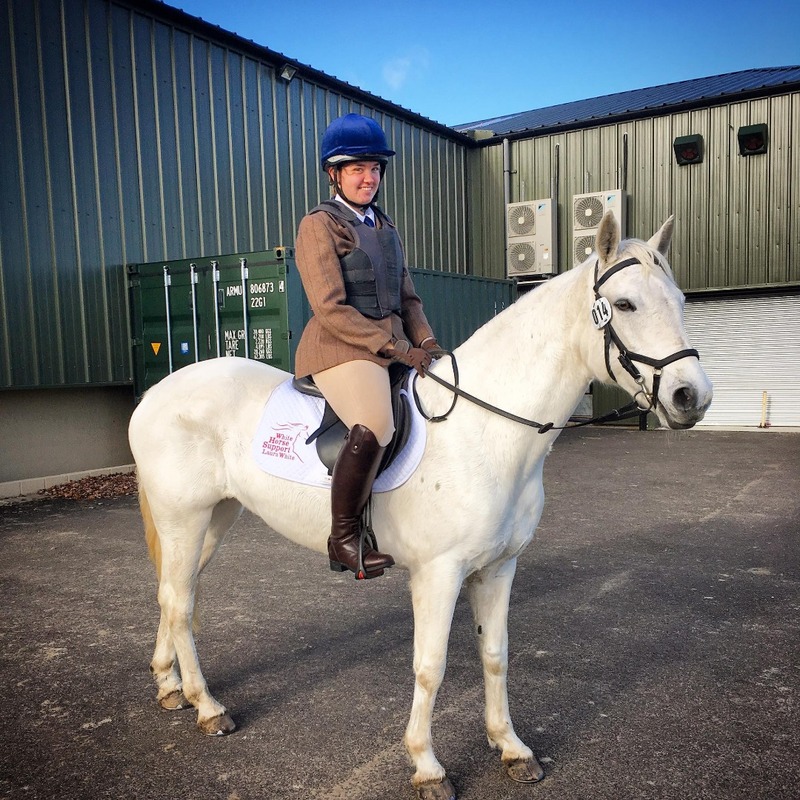 Team White Horse Support turn their hooves to Dressage! On 25th May we headed over to Chelmsford Equestrian Centre to take part in their Unaffiliated Dressage evening. Ashleigh and Honey did their first ever test and came second in the Intro B class and Whizz and I did our first Novice test together! We gave Novice 28 a go and scored a pleasing 61.8%, not bad considering Whizz was tense and calling for the entire test. White Horse Support's newest team member arrives! I'd like to introduce you all to Jumping Jersey (Jez). He is a 5yr old Cob cross who has been backed and ridden previously. He's been out of work for the past year but looks to have great potential and is a work in progress. Team "White Horse Support" get their first rosettes! So on 13th May Clare, Marian, Lisa, Ashleigh, Jill & I took Whizz and Honey over to the Codham Park annual show. Whizz and I competed in a Working Hunter class and Ashleigh and Honey did the In-Hand Coloured class. We both came away from our classes thrilled, having both gained fourth place! A very enjoyable but tiring day but I think it's fair to say we're all looking forward to the next outing for the Dressage at Chelmsford Equestrian Centre on 25th May. I now have 2 beautiful show rugs for Belle and Whizz to wear whilst they're out and about! 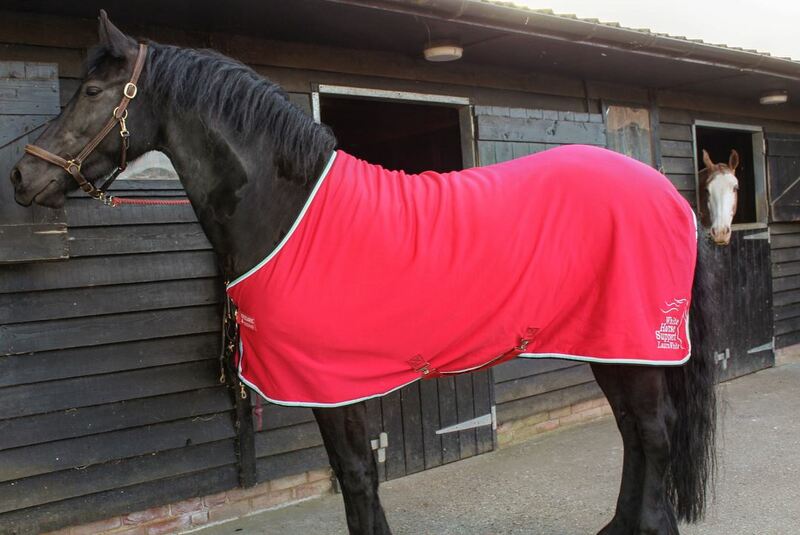 The rugs are Amigo jersey fleeces by Horseware Ireland and are just amazing. Can't wait for the girls to get out in these for our first show at Codham Park Equestrian on 13th May. If you would like to purchase your own, just drop me a message to discuss. On Monday 23rd April I am off to Trent Park Equestrian Centre to sit the remaining units for my British Horse Society Stage 3 exam. Once achieved this will make me a Stage 3 Complete Coach in Horsemanship (previously BHASI). This will also allow me to become a BHS Accredited Professional Coach (previously Instructors Register). I've already achieved my Riding (flat & jump) at Stage 3 so it's just my Care and Lunging units to be completed. Wish me luck! Results will be posted, I promise! Yet again Trot On Embroidery have done an amazing job and embroidered 4 beautiful Premier Equine Saddle Cloths for myself and clients to use in competition. Currently I have 4, 2x Full Dressage Squares & 2x Full GP cloths. However if you wish to purchase your own (available in a range of colours!) please just let me know and we can organise. I really can't wait to see these out and about in use! What this space for further personalised WHS items!! On 25th March 2017 Church House Farm had their first Unaffiliated Dressage competition for 2017. I'm pleased to say it was a great success and their next Dressage event is on 6th May.